I see a lot of questions about sales tax in the Intuit Community forums, so I’ll give a quick overview of how to set it up in QuickBooks. The sales tax preference must be enabled. You need one or more sales tax items and possibly some sales tax groups in your Item List. When you create an invoice, you must have a taxable customer tax code selected, a sales tax item or sales tax group selected for the tax, and any taxable charges must be set as being taxable on the detail line. To start, you need to enable the sales tax preference. 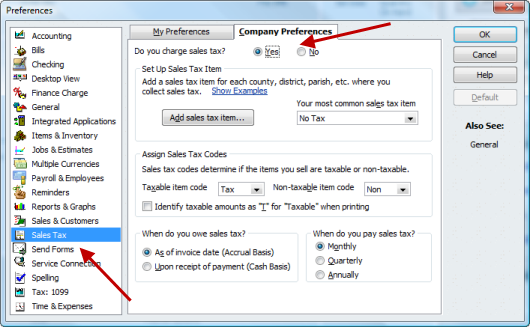 Select Edit then Preferences and select the Sales Tax prefence. Click on “Yes” for the question “Do you charge sales tax”. In the lower half of this screen there are several options to review to make sure they are set properly for your business (how often you pay sales tax, and so forth). As you probably know, all charges that you add to an invoice must have an entry in the item list. Sales tax is the same. You will create one or more sales tax items in the item list. You can do this by clicking on the add sales tax item button in the preferences screen, or by adding an item to the item list in the normal way. Enter the percentage for the sales tax, and a vendor for who you pay that sales tax to (typically your state sales tax agency). So what do you do if you have multiple jurisdictions? You could have a situation where you have a state tax, a county tax, a city tax or even more. When you file your reports to the state tax agency you need to split out the amounts by jurisdiction, usually. If you use this sales tax group in an invoice the rate will be 8.1%, but the program will report each tax separately. Please note that if you have a large number of taxable jurisdictions this can become very complex. You need to have a sales tax item for each jurisdiction, and a sales tax group for each “nexus” or location that has different combinations. There are third party add-on products that help with sales tax tracking, but these usually are reasonable only if you have a large number of invoices to process. Back in the preferences section, in the dropdown list Your most common sales tax item you can select the sales tax item or group that you most commonly use. Now, let’s look at your customers and items. Some customers are taxable, others are not. Some items and services are taxable, others are not. We will set up both to have the usual value for taxation, although you can always override this when needed. Edit your customer, you can specify which sales tax item or group to use for this customer. Also, the tax code needs to be set – it should be set to tax. Edit your items to specify if they are taxable or not – select the tax code of tax. Let’s create an invoice for this customer. The default values for the tax related questions are taken from the customer record and item records used. Three things must be set to have sales tax calculate: The customer tax code must be taxable, the tax item or group must be selected, and the tax setting on the item must be selected. If this all happens, sales tax is calculated properly. Remember, you can override these if you need to change something for a specific situation. If one line isn’t to be taxable for some reason, change the tax setting on that line to non taxable. If the customer should get a different tax rate, change the tax item or group for the invoice. You can also change the customer tax code. I’ll talk about sales tax reporting in a future article. Note that to get the most efficiency out of your QuickBooks program you want to set up and use your sales tax items properly. For another approach to deal with sales tax in QuickBooks see my article on AvaTax Calc, and excellent add-on product that works with QuickBooks to manage sales tax information and reporting. Charlie: Has a bug newly developed in 2011? Seems the sales tax payments are not being adjusted due to a tax credit as has been the case before now. In other words, tax for individual jurisdictions are not adjusted for, example, a sales tax collection credit. Any idea what has happened? Jerry, I’m not aware of a problem in the latest revision – there were some sales tax issues in earlier revisions, I believe, but I don’t think it related to this. Can you give me a specific example? Hi, could you please help me, when I’m setting up a database for the first time, with cash basis reporting, the first month in January, I paid sales taxes for the last quarter of 2013. How do I record those sales taxes in my new database? I’m pretty sure, I deducted those sales taxes from last year’s taxes but in order for my account to be balanced, I have to show them. Rosena, that is something that you should talk to your financial advisor about. There are multiple considerations. It also depends on how you set up your accounts in QuickBooks initially. Did you enter outstanding invoices, with the sales tax defined? That would put the amounts into Sales Tax Liability and you have to deal with that in the proper way. Did you just enter a balance forward for your various accounts? Then you wouldn’t be using Sales Tax Liability most likely. Many variations depending on what you have done. Obviously when a businees buys goods from Vendors there has to be VAT charged on them as well , How is this catered for? I’m referring to the US versions of QuickBooks here, and if you are referring to VAT then I assume you are using a non-US version. Sorry, I don’t have a copy of any of the non-US versions to work with. Charlie: In the Pay Sales Tax window, the list of Sales Tax items and jurisdictions appear along with the amount due. When adjusting the total tax amount because, in the case of ny, a sales tax collection credit is due, the individual amounts are adjusted. For the first time I can remember, these adjustments aren’t made and the inial amounts remain the same. Paying the new net amount can be done, but company records will show a balance sales tax due because the adjustments weren’t made. I thought I would repare the company file but wanted to hear your opinion on what may have happened. Think I found the problem. Will advise. Thanks. Jerry, What is the answer because I can’t find how to adjust the sales tax. I am paying later so the state is charging me more but I don’t know how to add to the final amount. Ready to pull my hair out. Good article, thanks. And remember, always make new sales tax items when your sales tax rate changes. Just changing the old rate can confuse the relational database that is QuickBooks and corrupt the file. (I just went through this with a client). I have a client I am trying to input data from a different software & he MUST have the invoices look identical to what his customers have been receiving. So with that said…I have invoice’s that have multiple state’s on 1 invoice with different tax rates….any idea how I can acheive putting this on a quickbooks invoice??? For example: customer is being billed at his home off in California but has leased products in MA, GA and IL. All three states are invoiced on 1 invoice. If you have multiple sales taxes applying to the SAME item, you can’t easily break it out without doing a lot of rearranging of the charges. Can you clarify…I am pretty good with dealing with sales tax. My question is why doesn’t the sales tax show up on an A/P report…do I have it setup incorrectly or is this just the way it is? Linda, Sales Tax doesn’t post to Accounts Payable, so it won’t show on the A/P report. It posts to Sales Tax Payable instead. You would see that amount in your chart of accounts, as well as in the Sales Tax Liability report. Hi Charlie – I have a client in audit that needs a report with invoice item, qty, sales price AND sales tax paid. Is this even possible? Sharon, not directly, because QuickBooks doesn’t calculate (or record) the sales tax on an item by item basis. Sales tax is recorded as one value for the invoice. You are asking for the item detail, and you could only get an estimated value of the sales tax for each item detail. The sum of the estimated value for each line in an invoice might not match the actual sales tax collected in an invoice due to rounding differences. It may be off by only a few pennies, but if you are auditing that would be a problem. Thanks – guess we’ll have to run a couple excel files and merge. Any way to edit the sales tax item, so instead of sales tax payable, it’s posted to a reimbursable tax expense account? No, the sales tax items have to post to sales tax payable. You can always try playing with an “other charge” item instead – but note that this information then won’t post to any of the sales tax reports. Sales Tax Items & Sales Tax Groups have been working like a charm when I followed Doug Sleeter’s instructions years ago. Now I have a dilemma because every quarter up till now has had different sales tax in California. Since I use several jurisdictions this can be a nightmare to set up sales tax for each quarter for that jurisdiction. Also, how to keep history in case of a sales tax audit. Does anybody have suggestions? I have been trying to account for tax in my quick books file , so far i have had no problems with accounting for sales tax , as demonstrated by your kind self. But i ma still not able to account for purchase tax in the system when entering the bills. Hussain, that depends on the accounting regulations of where you live, and what you are purchasing. Tax on items may be something that you have to incorporate into the “landed cost” of the item, or it may be an expense, depending on many factors. In any case, it is not a “tax” that you have to report usually, if the items you are purchasing are items that you are using in your business. How do I change an account that is associated with an item on my item list? For example – if I create an invoice for work I did in New Jersey the invoice is booked against my New Jersey Sales but the account on my item list says New York State Sales Tax Payable. Nicole, are you talking about a “sales tax item”? Because if it is a regular item (service, inventory part, etc.) you shouldn’t be using the sales tax payable account normally. If you are using a sales tax item you would want to create a separate sales tax item for the other state. If you can be more specific as to what you are doing that would be helpful. Sorry Charlie (also sorry for calling you Jerry). Yes, I am talking about a “Sales Tax Item”. Let me see if I can better explain this. I perform work in NJ, CT and NY. Therefore I have 3 separate “service” items set up for each state. I also have multiple “sales tax items” set up as each state has its own sales tax rate (along with some jurisdictions have their own rates within New York). According to my item list each “sales tax item” is associated with my New York State Sales Tax Payable account. To see if my New Jersey sales were being incorrectly booked against my New York State Sales, I looked at an invoice I recently sent to one of my NJ clients. Under the “Item” on the invoice I have NJ and under the sales tax I have NJ. So I then looked at my sales tax liability to make sure the services were calculated under NJ and they are. However, the New Jersey Sales Tax item on my item list says account – NYS Sales Tax Payable. Shouldn’t it say NJ Sales Tax Payable? I hope I was able to clarify things. Nicole, when you look at the sales tax item, what “field” are you referring to? The “Tax Agency” field? Each sales tax item should identify the taxing agency using the Tax Agency field – that is what is used to separate things in the Sales Tax reports. Look at the screen shot higher in this article, you see a “sales tax item” window – there isn’t an “account” field there. All sales tax items post to one account, Sales Tax Payable. You don’t have different payable accounts. Just to check, are we talking about the Windows Desktop version of QuickBooks here? Each “Tax Agency” Field is correct within each item which is why the sales tax and sales are showing up in the correct state on the sales tax reports. On my chart of accounts, I have 3 Sales Tax Payable accounts – NY, NJ & CT. NY is the first account listed which is probably why the anything associated with as a “Sales Tax Item” is going to that “account”. If I open the “Item List” I see the following Name, Description, Type, Account & Price and that is where I am asking about changing the “account”. Not in the “Sales Tax Item” window. Because you said “All sales tax items post to one account” – Maybe I just need to adjust my settings to remove the “Account” Field column as maybe that is what is confusing me. Nicole, I’m sorry, but you are not using the sales tax feature in QuickBooks the way it is intended to be used, from what I can tell. It is difficult to be specific without being able to actually see your data file. Review the article above. It sounds like you are putting your “sales tax payable” accounts in the individual item records, rather than using a “sales tax item” specifically. As you can see above, there is no “account” field in the sales tax item record. I recommend that you contact a consultant who is familiar with Quickbooks and how it manages sales tax. You can use the “Find a Consultant” link at the top right of this page. Or if you wish, you can send me an email with your contact information and I can refer you to someone in your area. Maybe I can add a few key points here just to make sure you’re undertanding QuickBooks items. There are several TYPES of items, Inventory, Non-inventory, Services, … a few more… and then Sales Tax Items. As described in this article, Sales Tax items are used to calculate the amount of sales tax to charge when selling “taxable” items (That is, when selling services, inventory, or non-inventory items that are marked as TAXABLE). So each sales receipt or invoice lists which items are sold as well as which sales tax item(s) are used to calculate and accrue sales tax payable on that sale. All sales tax items use the SAME general ledger account to accure the tax. By default that account is a liability account called “Sales Tax Payable.” You should NEVER attempt to set up multiple Sales Tax Payable accounts because there is no way to make your sales tax items point to any other account than that default account. So to separately track the sales taxes you’re collecting for each state, you can set up multiple sales tax items (e.g NY tax, NJ Tax, CT Tax) and set their respective rates and “tax agencies” so that the taxes will be tracked separately according to who you PAY the tax to (i.e. the tax agencies). So since you’re trying to fix a file that evidently was set up by someone else, you might have a mess on your hands. The ITEMS should point to revenue accounts (don’t try to point them to sales tax payable!). The sales tax items will always use Sales Tax Payable to hold the calculated tax. The sales tax reports will list the amounts in Sales Tax payable, separated by “tax agency”. That is how you know how much is owed to each agency (or state in your case). Well that is a bummer. I was just trying to fix the way QB is currently set up. More of a reason to start with a new fresh version. Thank you for trying to help me. I appreciate it. Thanks for the article. One question…is it possible to have multiple Sales Tax Payable Liability accounts? In Utah we pay monthly sales tax but for special events we have to pay that sales tax separately. I do not want them to lump together under one GL account, I would like to have a sub account for the special events. Yup, only one Sales Tax Payable account, if you want the tax to show in the Sales Tax reports. If you want to treat it totally differently, you can create your own Other Charge item for a percentage, but then you lose the special handling that you get from the sales tax system in QuickBooks. I have a dilemma that I am hoping you can solve….I have a client that paid sales tax via credit card, but it looks like you can only pay sales tax via a bank account in the Pay Sales Tax screen. Any advice on how I can handle this? Kristie, I don’t usually give very specific answers to specific questions like that, as I don’t have access to your company file AND I am not an accountant. In general, I would think that you could generate the sales tax payment in the normal way, changing the check number to something other than a real number (like “DB” or something), but then do some adjusting entries to balance out the checking account and the credit card (which should NOT have been using “sales tax payable” as the account). That would work, but I’m not sure if that would be the best way. You should talk to your financial advisor about this (as long as they understand that you MUST use “Pay Sales Tax” from the Vendor menu to make this payment in QB), or you can find a local advisor who could help by using the “Find a Consultant” widget at the top right of this page. I have a client that charges tax on every item she sells. Can sales tax be calculated in the aggregate as one line on the bottom of the invoice? Michael, that is the normal way that you see it, as one sales tax charge at the bottom of the invoice. Are you not seeing that? I guess that depends on what exactly your client is trying to accomplish. Are they concerned about how rounding is done? sales tax is applied item by item, and that might give you a slighly different calculated value than if you apply it to the total taxable value. If that is a concern, you can put a “subtotal” item after the last detail line, and under that put a “sales tax” item to apply the rate to that subtotal. You hav eto set the “tax rate” in the footer of the invoice to be a zero rate. However, that isn’t as flexible. It won’t print the sales tax in the footer of the invoice, it will just be another line item. It won’t let you use “sales tax group” items. Here’s my dilemma…in the ‘pay sales tax’ window there is a line item which has no item name or vendor name but it has an amount due. I can’t seem to find where the amount is being calculated. QB will not record a payment for this item because there is no vendor to pay. Tried clearing with a Gen Journal entry but QB has to have a vendor. How can I track where the amount is coming from and how can I get a vendor name in the item? Unfortunately, I inherited this problem. Any advice would be GREATLY appreciated. Chris, I’ve not seen that myself. Journal entries won’t do the job. Do you see this in the Sales Tax Liability report? If so, you can drill down to it from there. If you don’t see it there, sounds like a damaged file. You can try doing a “rebuild” of the company file – but you may need to talk to a consultant who can look at your file. ProAdvisors have a version of the software that provides better diagnostic tools. Our Sales Tax is 3.5% on the first $1000 dollars and then the remainder of the purchase is at 3%. Anyway of doing this without subtotals and then spiliting up an item over $1000 dollars which confuses the customer and can mess up inventory. Mark, off the top of my head I don’t have a great answer for you, although I’ve seen this discussed in other forums before. You can add a sales tax item as a line item and enter a specific amount – but you have to do the calculations yourself. There are some cascading issues if you do this, as it affects your reports and how tax shows on the invoice. It is something that you should play with in a test company to see if you like it or not. I’m not necessarily endorsing that approach at this time, as I haven’t fully tested this. This sales tax issue in not uncommon. Is there still no solution QuickBooks 2013? I have a county showing up on sales tax liability report but when I go to “pay tax” it is not showing up? What do I do to fix this? Christy, hard to say. I would look at the date of the report to make sure it matches the date of the Pay Sales Tax window, to start. You might want to talk to a ProAdvisor to have someone look at the file if you can’t figure it out – people who have the Accountant versions of QuickBooks have special tools that let us look at the inner workings of the file (the “Client Data Review” function). This may not be a good place to ask this question.. I am a graphic designer. I design business cards and I order them from an out of state printer that does not apply sales tax. I sale the business cards for the same price I purchase them, but I charge for the design and not the card. Do I have to apply sales tax to the sale of the cards? Or do I have to apply the sales tax to the sale as a whole? Hopefully I wasn’t to confusing.. I am trying to figure this out so I can have Quickbooks organized in the legal fashion. Courtney, every state has different tax laws, and I’m not familiar with Louisiana (other than to know that some legal issues are treated VERY different down there!). You need to talk to your state tax agency to get that answer, or your local financial advisor. Off the top of my head I would say that in general you would be required to charge the sales tax on the entire amount. However, I’m not a CPA, so don’t make your decision on that. Check with local advisors and officials. Thanks Charlie… for taking out time to give some kind of answer. I will find out and if you don’t mind, I will post something for other designers to go off of. Jeff, that is a complicated situation. You would be better off working directly with a ProAdvisor (you can use the “find a consultant” search box on this page) who can look at your specific company file. There are several ways to deal with this and the proper choice depends on a number of factors. You definately have some issues in the sales tax reports if you have been making payments through regular checks. Our business is based in Idaho where we do not charge sales tax, but we do a lot of business in Washington 7 miles away. We charge a sales tax and it shows up on all of our Sales Tax Payable reports. My question is about deposits. When we take the deposits to the bank, we take the amount of the sales tax and put it into a seperate bank account to pay the taxes with. Often we are depositing multiple checks at a time. This becomes a big pain when we are reconciling the deposits because our main business account is always off balance because it includes the sales tax. Is there a way for QB to automatically funnel the sales tax amount from the deposits straight into our sales tax account so everything balances out? Jill, I’m not sure what exact steps you are taking. You have an invoice for $101.00, and $1.00 of that is tax. You are paid with one check. You have to deposit that check into one bank account because it is one check. So how do you move the $1.00 into the other bank account? You need to do something (an adjustment, transfer or some other transaction) to move the tax from the one account to the other. However, that doesn’t affect the sales tax payable – that doesn’t care where the money is UNTIL you “pay sales tax”, which should then be directed to that separate account. They can also, in the make deposit screen (they need to be using undep funds), add a line item posting to the sales tax account. Say the total is $10.60, and $0.60 is sales tax. That will take care of deposits to both accounts at one time. Hello, I have a client that creates an Estimate, then creates several invoices off the estimate. when does the sales tax turn into a “sales tax liability” when the estimate is created or when the invoice is created? what if invoices are created in different Quarters? then is the sales tax liability spread across the quarters as well. All sales are in CA. Chris, an Estimate is not a “posting” transaction. It has no effect on your financial statements. It is an offer you make to someone, essentially. Sales tax won’t be a liability until you create the invoice. That is the “posting” transaction. So that is when the sales tax liability is updated, and the invoice date is the date used for the liability. Only the sales tax amount in the invoice is posted. Soy de Costa Rica. Tengo un cliente que en algunos artículos paga el 0.13% y en otros el 13%. Como hago para personalizar esto, ya que al asignar el Tax Code al cliente me lo aplica a todas las líneas de la factura? My apologies, unfortunately I don’t understand Spanish. Here in Argentina, we have Sales Taxes for about 21% (called IVA). When I Sell Services or Goods, I Charge this Sell Tax Items in the Invoice, generating an Increment in the Sales Tax Payable Account. But when I Buy goods or service, I can discharge (or assume as a credit) the same amount of taxes of my Providers Bill. At the end of the month, I pay to the State the diference between Sell Tax – Buyed Tax. I create an Invoice for USD 1000 + IVA (1210 USD). For this Invoice I will pay to the state 210 USD at the end of the month. If I Buy Goods for 800 USD + IVA (968 USD), I Can use this billed IVA to reduce the tax liability. So, I Will Pay to the state only the IVA Sell – IVA Buyed, only 42 USD. At the present, I Use the Adjust Tax Liability function to adjust this issues… The Liability decreases and the diference are increment an Income account called Taxes Credit. 1) How can I do to enter my Bills with this IVA Credit for QuickBooks automatically reduces the Tax Liability and Showme how much I will pay at the end of the month? I’ll assume that you are using the US version of QuickBooks. If you are using a different national version, this might not be the best approach. Note that I am not a CPA or accountant. Also note that you should check on your local tax laws to make sure that this works for you. I don’t know your specific requirements for how things are reported. In general, you can set up an OTHER CURRENT ASSET or OTHER ASSET account in your chart of accounts that you call something like “Prepaid Sales Tax”. When you create a bill or check, enter the sales tax amount on the Expenses tab using that account. This will help you track the amount of sales tax that you have paid. Then you would use the Adjust Sales Tax Due function, select that account, select “Reduce Sales Tax By” and enter the amount of sales tax you paid for the appropriate period of time.. Later when you pay your sales tax you would see both a positive and a negative amount, I believe, and you would select that. You should test this on a trial company before actually implementing it. I have the problem that my customers are used to specific amounts for each product. Now switching to quickbooks, these amounts will change and become “ugly”. For example, I always charge my customers $560 for an item. That is the price they see on the invoice, and I have a small line saying (of which 10% VAT or $50.90). Now switching to quickbooks is it possible to have such a line? Because the way it describes in this article, I would have to sell the item for $509.09 and add another $50.90 for VAT. Peter, are you using a non-US version of QuickBooks? If so, I’m not sure how they handle VAT. No I am using a US version of Quickbooks. Peter, I’m not an expert on VAT, so I don’t know if that is suited to using the sales tax feature in QuickBooks, or to use another method. However, if you have a limited number of items, you can use “group” items to handle this. 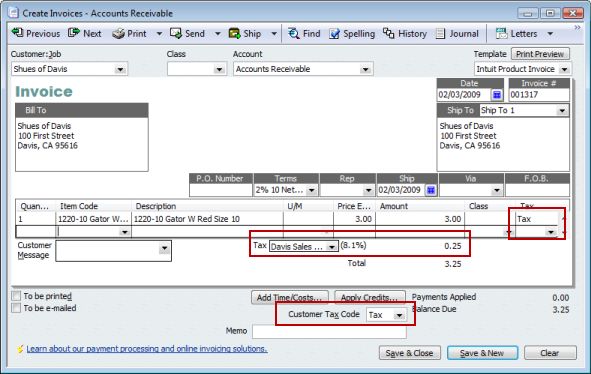 Create a group item, include the product in the group AND include a sales tax item in the group. The group will be the total amount, it will show (if you set the group up correctly) just one line for the item, and you get the proper calculation of tax for the item. This would work even if you have a large number of items, although it gets a bit tedious to set that up. Thanks alot this does solve my problem. We collect the actual sales tax from the customer. However, when submitting the sales tax to the state, the state requires rounding. What is the best way to account for the difference in the amount collected and the amount paid? For the rounding issue, use the “Adjust Sales Tax Due” menu item under the Vendor Menu > Sales Tax. In the adjustment, put a positive or negative amount to round to the nearest whole dollar, and code the difference to some expense account such as Miscellaneous Expense. Why does my sales tax report not show total sales for the month? I pay tax on PAID BASIS not on Accural. ? I invoice several clients that have multiple locations and the locations are in different cities throughtout California, thus the sales tax are different depending on the cities. How do I get QuickBooks to report the sales taxes on the sales tax liability report correctly. Tracy, you could set up a different sales tax item for each different location. Then make sure that the invoice uses the proper item. Then each will be tracked properly in the reports. on my sales tax liability report, why is there a difference in the amount between my tax collected column and the sales tax payable column? I tried to trace the amount from the report but there was no way, it just kept reverting to the same report. Marianne, it is tough to give specific answers without seeing your file. You may want to work with a ProAdvisor (you can use the “find a consultant” link on this page) to work with you – people with the Accountant editions have additional tools for sorting out sales tax issues. Usually discrepancies come from making journal entries to Sales Tax Payable, or paying sales tax with a regular check, etc. But there are other possibilities. Including file damage (don’t worry at this point, that is not high on the list of possibilities here). In any case, without seeing. Two things I’ll point out to look for in the Sales Tax Liability report. First, you can double click on a specific figure in the report (in the columns you refer to) to get a detailed report. That may show you where the figures come from. Second, note that the “collected” figure will be the sales in the period you have selected. The “Payable” figure will include not only those sales, but any unpaid liability you have carrying over from prior periods. In general, when you see the “other” notation anywhere in QuickBooks, that means that you have accounts and subaccounts, and you have some payments to both the subaccounts as well as to the account that is the “parent” account – that is the “other” account. Again, you can double click on the line to start to drill down to the details. Sam, that’s not clear. If you don’t set up the customer, how would QB know what state they are from? My customers are being imported from ebay with the address but they are always taxable, How do i make that the customers who there addressses is outside of NY state shouldent be taxable ? Sam, you don’t mention how you are importing from eBay, so I can’t say much. There isn’t a way to deal with that in QuickBooks itself, if you are importing transactions. It is something you would have to look at on the import side of things. I was talking to Karen Magno of Baystate Consulting about this. They have an excellent transaction import tool. There is an article on their website that relates to importing from eBay, although it doesn’t address this particular issue (http://support.baystateconsulting.com/KB/a15/ebay-imports-into-quickbooks-using-transaction-pro-importer.aspx ). Essentially, she says that due to the way that eBay presents the data, it would take a bit of manipulation by you, but she did think that it would be something that might be possible. But it wouldn’t be an automated solution. I am having a problem with Sales Taxes. We have a Self Storage Unit facility. We invoice our clients every month at the 1st. Some customers pay early therefore placing their payment in the previous months income. I find the sales taxes followes the invoice date not the tax period the taxes were collected. I changed sale tax preferences to “cash basis” but this no effect as to the date the taxes were actually collected. I’m I going to have to report the sales tax to go with the date of the invoicing? I am pulling my hair out. If I can’t figure this out, I’ll be bald in a week!!! Sorry, Brenda, sometimes it takes a bit of time to get around to all the blog comments. I’ve not use the sales tax preference setting to change it to “cash basis”. However, I would guess (not sure) that if you change it that would only affect new transactions going forward. It is something I’ll have to dig into later on. Doen’t the accrual basis report invoices that have been created but payment has not been received yet. This is where my problem starts with sales taxes. It is accruing sales tax figures that have not been collected. What about sales tax I owe on purchase made online or out-of-state? How do I make a vendor purchase appear in my sales tax payable? I’m about to open a Yogen Fruz store in Puerto Rico and already bought the quickbooks program. I’ve been playing around with the program so I can have a better understading of it. My question is; Where should I register daily gross sales(Sales + Sales Tax Payable) so I can differenciate Sales from Sales Tax? Because I look in the customer tab and didnt see anything I could use to register Sales. The only way I could think of was to enter them via deposit, but then again didnt know how to separate sales from sales tax. Luis, you have to enable sales tax in your company preferences. Then you have to enter your sales via a transaction like a sales receipt. You can enter the sales tax as a separate item in the sales receipt. I am currently reviewing how my company records sales tax. One of the requirements we have to meet is designating the amount of tax dollars collected per income type (labor, materials, rentals..etc). Currently we use the item column to designate each line of an invoice as a certain type of income and from there calculate the sales tax per type. This, I feel, is not the best approach, but unfortunately, tax groups seem only designed to be for tax jurisdictions, and does not accept a tax group designed to split taxes between labor, materials and so on. Would you be able to point me in a direction I could take to learn more about how I could set up sales taxes in Quick Books to accommodate this requirement? Calvin, I don’t know that I have an answer for you. I’ve not seen a requirement to report sales tax the way that you talk about – usually the primary issue is to calculate the correct amount of tax and accrue it by taxing agency. I’d have to learn a lot more about your requirements, why you need to report this way, and how you create your invoices before I could give you much help. The problem I am experiencing is when I select the tax item when rasing an invoice, the letter ‘T’ appears next to the amount when the invoice is printed on paper; btw the letter ‘N’ does not appear when ‘Non Taxable Sales’ item is selected on the invoice – can you help? I sit on the board of a non-profit organization and have been asked to review and correct some bookkeeping issues with QB 2011. I need to create some invoices to off-set some credit memos that were previously randomly created. The organization does not collect sales tax. When I try to create the invoice, I get a popup message that says I must assign a sales tax code to the line item. When I go to the item list, there is no option for setting a tax rate; I assume because in the company preferences it is set up that we do not collect sales tax. I am unable to create the invoices because of this. Any assistance as to how to fix this issue would be greatly appreciated. Thank you. Becky, I’ve not run across that message myself, and I’ve not been able to set up a test situation that creates that message. I would start by double checking that the sales tax preference is indeed turned off. If that isn’t the issue, feel free to contact me directly through the email address in my author profile (at the end of the article), I can take a look at the file and let you know what the issue is. Thank you for your response to my query. I have checked the company preferences and it is set up that we do not collect sales tax, thus getting the message regarding sales tax makes no sense whatsoever. I’m no expert, but I have been using QB for a number of years and can usually figure out what’s going on, but this has me stumped. I was going to attach the file to an email and send you, but the file is too large. Any suggestions would be greatly appreciated. Becky, don’t attempt to send me the file, just send me an email message so we can discuss details. Ah, now I see it (with your file) – the “sales tax” preference is stuck on internally. Essentially what you need to do is to turn the sales tax preference on, save preferences, then turn the sales tax preference off. That resolves this issue. When you turn the preference on you’ll need to create a sales tax item, you can create one with a 0% rate. You don’t need to set your items and customers to “taxable”. Thank you SO MUCH!!! I’ll try that later, or perhaps tomorrow. I’ll let you know if it works. That totally fixed the issue. I am forever in your debt. Thank you so very much!!! Glad it worked, sorry I didn’t think of trying that sooner! How do I get QuickBooks to charge sales tax on finance charge please? It appears that State of MS requires it. Thanks. I’ve not come across a situation where a finance charge would be taxable, Very odd! There isn’t a simple way, at least not that I’ve found. You can create your own invoices for the finance charge, avoiding using the automatic system, to manually assess a charge using a taxable item. You can also find the finance charge invoice after it is added and manuall enter a sales tax item as a line item – you have to enter the amount of the tax, as it won’t calculate it for you. Best I can come up with. I saw the same question from someone in MS in another blog and there was never a reply. …but thanks for the response! My problem is, we should charge 02 taxes based on our invoice amount, and 1 tax should charge based on invoice amount + other tax . That means tax on tax. Further we should show both taxes separately in invoices according to law. Fernando: I assume that you are not in the U.S.? Perhaps the Maldives? And that you are using the US version of QuickBooks? The US version doesn’t support that kind of tax structure as a part of the sales tax feature. We don’t have that kind of sales tax situation. You might look at the Canadian version – although I’m not up to date on the latest taxation laws in Canada these days. They do have a tax on tax situation, but I don’t know how well the Canadian version of QuickBooks deals with that. And, if you already have data in your company file with the US version, you can’t easily convert that to the Canadian version. I would not use the “sales tax” feature. Instead I would work with subtotals and an “other charge” item with a percentage. Enter your items to be sold, add a subtotal item. Under that add an other charge item for the 10%. Then add another subtotal. Then add a last other charge item for 6%. This gives you the correct amount on the invoice, and it posts the tax amounts to the account you select. What you don’t have is the reporting/payment tracking for sales tax that you get with the “sales tax” feature. But it is still manageable. Thank you very much Mr Charles. Highly appreciate your answer and effort. I work for a company located in NC that is in the business of reselling services, sometimes to a customer that also resells those services again and sometimes we resell the services to the end user. For example:Company A is contracted by McDonalds to install drive thru camers at 1000 different McDonalds located in various states all through out the country. Company A then contracts my company. We then locate and contract different vendors to perform the services. Currently, we collect company A’s resell certificates for each state that the McDonalds are located in because they are not the end user and do not have to pay the sales tax. However from what I have learned about reporting our sales and use tax, we need to report our total gross sales in each state not just our tax exempt sales. How would I track this with the quickbooks online version? Ashley, my apologies, I don’t work with QuickBooks Online. I’ll see if I can get someone to look at your questions. Ashley, I would use location tracking to track sales in QBO – that will enable you to pull reports that show gross sales for each state. Then you’ll be able to run a Taxable Sales Summary report, customize so that locations are displayed in separate columns and memorize. This will give you taxable sales per state. thank you for your quick response. How do I use location tracking? One more question (same person as above) I work for a company located in NC that is in the business of reselling services, sometimes to a customer that also resells those services again and sometimes we resell the services to the end user. When we resell to an end user, For example: We are contracted directly with Panda Express to install new POS machines at their various locations located through out the country. Currently, we are collecting sales tax for each different city and state that the corresponding Panda express restaurant is located in. This is creating quite a hardship on us for having to submit all the sales tax we have collected to each different city,county and state. Should we only be charging NC sales tax, since that is were we are located and Panda Express’s transaction is taking place with us in NC not with the vendors we have contracted? As far as the reporting goes, I can only suggest you contact the local tax departments to ask how you are required to track it. If you need any help, please feel free to contact me directly. There may be some other solutions, other than QBO that will suit your needs better. I have one general question. The company I work for was using only on Tax payable account for both tax collected and paid. Now we are switching to 2 general ledger accounts – Tax collected and Tax paid. I set up 2 accounts and items assigning taxes, and everything looks fine except when I create and invoice the tax portion gets shown under “the old – tax payable” account and not under the new one. Do you know how to correct this and change the GL account for a sales tax item list? Vanya, if you want to use the sales tax feature in QuickBooks, you can’t change the accounts. sales tax items always work with “Sales Tax Payable” and you can’t change that, unless you totally abandon their sales tax setup. wow, I would never guess this. Thank you very much Charlie! Ally, I’m not sure what exactly you are looking for. The invoices would be there, whether you turn off the sales tax feature or not. However, if you have turned the feature off, you just have to turn it back on the same way, by checking off that preference box. You would have to give me more details. If they are paying a lower price, I’d lower the price first. Then that would be what sales tax is calculated on. I have a client who wants to change the account for the sales tax item created in Quickbooks as it is defaulting to wrong account.Please could you tell how can we change the account for sales tax items. Sales tax items must always use the pre-defined account “Sales Tax Payable”. You cannot change that. Thank you in advance for response! 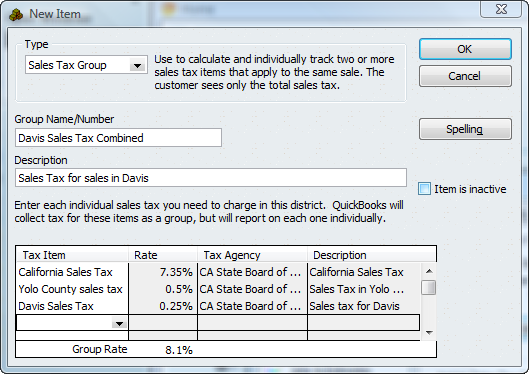 Randi, the sales tax feature in QuickBooks is set up to work with just one sales tax payable account. To see what the payable amount is for any particular tax nexus you would look at the two sales tax reports, which clearly define what the amount is that should be paid to each. That generally works better than trying to look at the G/L accounts, which don’t separate out the amounts due to be paid now from what is due to be paid later. Ok, 1 sales tax payable account it is. May I use the g/l account of choice? IE it defaulted to 2550, and I want to use 2300…that should be ok, right? When you turn Sales Tax on, QuickBooks will create an account titled “Sales Tax Payable”. That account is the one that will be used. You can change the account number, you can even change the account name, but that particular account will be the only one that is used. The connection is by the internal ID for the account, not the info that you see on the screen. Yes, and thank you for your prompt and thorough responses! I am pulling up the Sales Liability Report and it is showing me the count as other (i.e. Stark Co. – Other) and is not showing up under the vendor to be paid (Ohio Treasurer of State). Any ideas why this would be? It is making my reporting unorganized. I want to look under Ohio Treasurer of State and see which counties, cities, etc. I should pay. Wendy, there are a couple of possibilities, but it is hard to know without having hands on the file. You want to make sure that all sales tax items in the item list have a valid vendor (which they should). The simplest first step is to doucle click on that line in the sales tax liability report to open up a detailed report, which will list the invoices that generated those figures. Then look at the transaction and the sales tax item that was used. Sales tax isn’t showing up in the reports I am running. Is there a way to make it show up? Standard Profit and Loss. Chris, sales tax won’t show in a P&L, as it isn’t income or expense. It is an other current liability, so it shows in the balance sheet. If you have it set up properly, as discussed, then you see the sales tax info in the two sales tax reports, normally. Virginia collects sales tax on gross sales. Quickbooks calculates sales tax on net sale. How do I change this? Mary. I’m not sure how you are defining “gross sale” vs “net sale” in this case? Hi Charlie. How do I set up Quickbooks to pay sales tax on rental income only? All of the “Sales Tax Setup” information that I am finding only references how to charge sales tax on invoiced merchandise. Thank you. Jennifer, I don’t deal with rental businesses usually. Rental income is taxable? Seems odd to me. In any case, if your rental income is set up as a service item, you can make that taxable just like merchandise. I’m not sure that I understand what the difference would be in your situation. Can you explain in more detail? Thank you for your quick response. I should’ve explained that it’s commercial rental income. The sales tax is included in their monthly amount due. I was wondering if there is a way to pay the monthly sales tax directly from the checking account, through Quickbooks. Will I have to set it up as an invoice first, or is there a more direct way? Thanks again. You can pay sales tax any way that you wish, but if you want QuickBooks to track the sales tax liability (as shown above) so that it handles the due amounts for you, then you have to use the system the way it is set up, as I talk about above. WONT LET ME PRINT RECEIPT OR SAVE INVOICE IT SAYS THIS LINE CANNOT HAVE SALES TAX CODE APPLIED. IT ONLY HAPPENS TO A FEW OF MY INVOICES. ANY IDEA WHY THIS IS HAPPENING AND HOW I CAN FIX IT. I APPRECIATE ANY HELP! THANK YOU!! Nicole, I would have to see an invoice where you have this problem to be able to comment on it. For QB 2009 I’ve seen some notes about this error, but only relating to a “finance charge invoice” – an invoice created by the Statement routine to cover a finance charge. Is there a report in Quickbooks Pro 2010 to print a Sales By Customer and have it include my sales tax codes and amounts for each invoice for the month of June so I can export into Excel and reconcile???? I tried to modifying the report but cannot figure out how to include. Thank you but never mind, I figured it out. Glad you worked it out, Tanya. Share your solution here! Is there any way to update all invoices from one sales tax item to another sales tax item? We used 2 different sales apps that imported sales data into quickbooks and although they both calculated the tax correctly, only one sales tax line item has the correct percentage showing up in the tax liability reports… so it looks something like this…. When i drill down into the “Sales Tax Account” list, all invoices have taxes correctly calculated, but the liability report says tax collected was $0.00 for the $30,000 line item. I am currently updating every invoice manually to the ‘Sales Tax – 8.25%” tax item dropdown, so that the liability report states the correct amounts. If you look at the sales tax item in the item list it only shows you what the CURRENT rate is set to. It sounds like when those invoices were created that you had a zero rate for that item, and changed it later. Just guessing. You can’t change the rate in the list and have it affect existing recorded transactions – that would be a mess if it retroactively changed existing transactions every time a rate changed. Within QB itself there isn’t a way to do a bulk change like what you are talking about. You have to edit the rate in each order. questions on Utility tax – charge for two services water and sewer to customers. Want to put both the water service and sewer service on one invoice. The problem I am running into, is both water and sewer utility tax is different. So need to two lines on bottom of invoice to show both taxes, the water utility tax and the sewer utility tax. Tina, you won’t be able to get two lines in the footer of the invoice for taxes. You’ll have to enter them as separate line items in the body of the invoice if you want to show them as separate items, if you are using “sales tax items” to manage the tax. thanks. I put my Utility taxes in as separate line items. And at the bottom, add the word blank on the sales tax drop down menu, which made the sales tax block not to show on the printed invoice. another question, have you ever heard of billing on invoices for utilities (water or sewer) on an annual basis. Changing and fixing items from a previous employee. Tina, that is a whole different subject from sales tax. Lots of ways of dealing with it, depending on your situation. Few of them are really good (with QB by itself). Whenever I generate a report for sales tax due, I get a portion that is classified as unadjusted sales tax. Why does this happen and how do I correct this for past amounts, present and prevent this from happening in the future? I am sure that I have overpaid taxes. Robin, I would have to see the report to be able to comment on that. Does anyone have a link to something as informative as this but for Mac Quickbooks 2011, Simple Invoice – setting up sales tax? So I’m printing my sales for one of my vendors but the sales tax amount does not show? How can I make this work? Telisa, unfortunately that isn’t enough information for me to give you an answer. You may want to contact a QuicKBooks ProAdvisor who can look at your setup to see what is going on. Maybe you can help me. I am using QB to create invoices for a service business (flooring company). I am calculating sales tax on the cash basis, so when I created the sale tax tab on the bottom of the invoice, everytime I receive a payment from the customer the sales tax amount for that invoice is being recorded multiple times in my sales tax payable account. Do you know why this is happening? I am running the report on the cash basis, and there is this column that say’s “Paid Amount”, with a random number?? Shannon, I don’t work with “cash basis” clients, so I’m not familiar with the issue you refer to. I would recommend that you find a local ProAdvisor who can take a look at your file and determine what is going on here. How do I set up a single price tax amount? For instance, in my case, I need to set up a .10 federal tax on a box of firearm ammunition. This tax is not a percentage, just a set .10 per box of ammo (whether it be a box of 5 or a box of 100 rounds of ammo, it’s still just .10 per box). (1) Don’t use a sales tax item, use an “other charge” or “service” item – but then it won’t appear on the Sales Tax Liability reports. (2) Create the sales tax item as a percentage, but insert it as a line item (instead of at the sales tax option at the bottom) and remembering to change the percentage to an amount each time. Regarding the cash basis sales tax reporting scenario: The detail report on the drill down from the sales tax liability report is just plain messy and I hope QuickBooks figures out a better way to report it in the future. If a partial payment is made towards an invoice, QuickBooks randomly applies the payment towards pieces of each line item, and I don’t know of a good report that will explain what it did! Before filing a return I scan through the detail report just to make sure that I don’t have any obvious clients in the wrong category (such as a homeowner or a business showing up in a non for profit category, or a CT customer showing up in a NY district)but I don’t spend much time trying to figure out what got assigned to where. Carefully review your A/R aged list before filing a sales tax return to make sure there are no outstanding payments not applied to invoices. Unapplied payments don’t zero out invoices in the cash basis sales tax report – which results in an underpayment of sales tax. If you find any unapplied payments from prior periods, be careful about drilling down to the transaction level and directly applying the invoice – you will change the sales tax liability report in the prior period instead of the current period and will end up under reporting in the current period. Go into Payments and apply the credit instead. If you need to write off a balance on an invoice, create a credit memo and apply it to the remaining balance on the invoice. You’ll have to look at the original invoice to see what is taxable and what is not and back out the applicable amount of tax – you’ll have to do some manual calculating to figure out how much to credit. Also make sure that you use the Pay Sales Tax function (and assign the sales tax paid to the correct line item if you have more than one district) instead of writing a check and using the sales tax payable as the expense. If you use the Pay Sales Tax function properly it zeros out the sales tax liability – and then you can check to see if the amount still open makes sense. Always print out your sales tax liability report and save it with your tax filing – if something changes in QuickBooks later, you have the original report to compare to. My problem is that sales tax is not calculating correctly. I have non-taxable items at the top of the invoice with a subtotal. Then I have taxable items, with a sales discount, and another subtotal at the end of this section on the invoice. But the sales tax is not calculating on the net of taxable item less the discount amount. When I delete the non-taxable items, leaving in the taxable with the discount, the sales tax calculates correctly. When I put the non-taxable back in, it’s incorrect. How do I fix this? Virginia, I’m sorry, but without seeing the actual invoice and how you have it set up it is difficult to say much. It could be the setup of the discount item, but that isn’t clear from your description. I wish intuit would add the feature “use tax” to the program. It would work just as sales tax does with tax agencies and tax rates being created only instead of being available on invoices, sales receipts, and proposals, these would be available on purchase orders, bills, and checks to record a use tax that is due on purchases made and therefore a liability to the appropriate agency would be created. It would make life easier for contractors that work in various tax localities. Bev, the sales tax reports use the “Vendor Name” field (not the “company name” field in the vendor record). In my sample files here if I change the vendor name field, the change shows up in the sales tax reports immediately. I really appreciated your article. The problem I am having is that some of my tax rates change on a quarterly basis. When I change the tax rate, Quickbooks changes the tax amounts on all previous invoices. How can I make my changes, but keep all invoices correct? If you are using sales tax items, and you change the tax rate in the sales tax item, QuickBooks won’t go back to existing invoices and change their rate. OK, thank you. It used to change them. Your responses have been very helpful. We are a distributor, so purchasing all of our items for re-sale and, therefore, we are not paying sales tax with the purchase. When we sell, some of our customers are re-sellers (non-taxable), but most are end-users (taxable). We are implementing QuickBooks Enterprise currently. How do we set it up where we are not booking sales tax on our purchases, then charging sales tax where appropriate? Thank you for any help! David, on the purchasing side there isn’t anything you have to do. You just enter the price you pay for the item. On the selling side, you mark the items as taxable, but control taxation by the setting of the customer. If the customer isn’t taxable, the item won’t be taxed. If the customer is a taxable customer and the item is taxable, then sales tax is calculated at the rate that you assign to them. Thank you for your quick and definitive response. Sure makes it easy. We are in the midst of our QuickBooks implementation, so I will reach out to you to help us, if we need some help. On invoices in the bottom “memo” field we have a transaction ID entered. When I drill down on a sales tax report the memo column is pulling the item description. I need to have it populate with the bottom memo info. I have tried everything to make this happen. Any thoughts? Laura, that is the way it works. They are not being careful with their terminology on fields (this kind of thing happens in several places. Have you tried putting your info in a “custom field” instead? I haven’t looked at that particular report to see if it will pull the custom field info or not – some reports do, some don’t. Is there a way to upload all the tax entities from the states webfile into quickbook or do you have to enter all of them seperately when setting up Quickbooks? Jami, do you mean the sales tax items to get the tax rates? I’m not aware that any states have a QB compatible listing. Sometimes you can get it in an Excel file, but you would have to reformat that and use an import tool like Transaction Pro Importer. I’ve seen some discussions where people claim to have a file already formatted, but I don’t have a specific reference for you. If your sales volume warrants, you might look at the Avalara sales tax plugin for QuickBooks, which resolves that issue for you. Ok, I know how to enter the sales tax items now and no…. downloading them is not an option. But, one of the 1rst ones I entered I need to edit. I have looked all over, how do I edit them? Is that even possible? Does this article apply to QBs 2013 as well? Sandra, yes, absolutely. QuickBooks 2013 isn’t that different from older versions as far as basic data management – most of the changes are just in the user interface. I pay sales tax twice a year for my small business, yet Quickbooks has no option for that. Is there a way to get it to do that or should I just record it as an annual payment, which will not record my mid-year payment in my check register? Brian, QuickBooks handles that very well. When you print your sales tax liability and sales tax revenue reports, you can specify the period to be the half of the year you are working with. When you click “pay sales tax” (and you should ALWAYS use this feature to pay your sales tax) there is a box “show sales tax due through…”, so you enter the same closing date and pay that amount. So you can pay the first half of the year, and at the end of the year pay the second half, no problem. As long as you use the “pay sales tax” feature to pay that tax, don’t just cut a normal check. Thank you for your response. I’ve done exactly what you described in 2011 & 2012. I get both reports easily enough. I use the “pay sales tax” function; however, QB 2011 does not record a 1st half payment in my check register since I’ve got the “pay annually” option selected (there is no semi-annual option built in). When I go to pay the 2nd half, the “pay sales tax” dialog box has no record of the 1st half having been paid, it shows the full annual amount due. It does record the full annual amount when I pay the 2nd half, but there is no QB record of the actual 1st half payment I made. Just one more bug in this bug-laden application. Brian, are you using the US version of QuickBooks 2011? Is this Pro, Premier or Enterprise? I have the US version of QuickBooks Pro 2011. Brian, I don’t know what to say – when I look at the sales tax preferences in Pro 2011 I see options for monthly, quarterly and annually. This is with the current release, R12. The only difference is that I’m using the Accountant edition toggled into Pro compatibility mode – it should show me the same that you have. One would think that Intuit by now would have added a semi-annual option for those states like Ohio that allow it. Then again, if they’re not even smart enough by the 2011 release to have their log-in window open “activated” & on top, I’m not holding my breath that they’re ever going to fix all the other bugs. If I ever come across a different business accounting application, I’m switching. I’ve sorry for venting…I know you’re not responsible for Intuit’s programmers, & I truly appreciate you trying to help solve this issue. The sales tax reports all pull from invoice dates and not payment dates. We invoice a customer in January for 45,000. He made two payments, one for 10,000 and one for 11,000. Yet Quickbooks shows the sales tax due for January on the 45,000. Anyway around this except to pull a customer transaction report and narrow it to just the payments received for January? That will make the sales tax reports always wrong. Anne, have you tried customizing the sales tax reports to be on the “cash” basis instead of “accrual”? They generally default to accrual. Also check with your tax agency to be sure that they will let you use cash basis for sales tax reconciliation. Yes, it’s set to cash basis, both for the company and for the sales tax reports. The tax agency allows cash basis. I have pulled the tax reports and the sales by customer reports, they all show it based on invoicing, not on date payment was received. The difference between what Quickbooks says I owe and what I actually owe is 3800.00. Quite a difference. I’m thinking I’m going to have to redo about 7 years of sales taxes. Anne, in my 2013 R5 installation, if I have an invoice for $250 dated February and a payment for that invoice dated March, my Accrual basis “sales tax revenue summary” report shows the item for February, my Cash basis version of the same report shows the item for March. This is a situation where the invoice was paid in full. I didn’t get into all the variations that can occur with partial payments, etc. I’m having trouble with the Sales Tax Option when downloading transactions from my shopping cart into a new QuickBooks file we created. The problem is when the orders are imported into QB, a new Vendor “Sales Tax Agency” is created instead of using the existing one. All other fields (Sales Tax Item Name, Sales Tax Account) are correct, except Sales Tax Agency, which is not linking properly. This throws off the Sales Tax Liability Report in QB. Vignesh, I would talk to the company that creates the shopping cart that is pushing out the data to QB. Or, if you are using a connecting program, talk to them. I can’t say much without knowing how you are doing the integration and what data they are sending over. It sounds like this is a problem on the source side, not on QB’s side. Thanks for your reply. Well, my shopping cart allows me to export orders to an IIF file, which I import it into QuickBooks. I will check with them. That may be a part of the problem. IIF is a lousy way for products to use to import data. I never recommend anything that uses IIF, there is no error checking and it is easy to create bad data with it. We use quickbooks for its general ledger purposes. It will not work for our invoicing so we don’t bother putting in any customer info or any invoice info. But I need to record sales tax payments. Is there a way to put what we owe (we track it using our invoicing software) in one lump sum so that we can then record the payment and it gets deducted from our total income? Currently we are reporting it under the tax line “Miscellaneous taxes” which is not proper. From what I understand, it shouldn’t even show up in the gross sales amount at all. Tim, so how are you entering your sales figures? I would still consider using a transaction window – create one customer for “sales”, one service item for “sales”, and a sales tax item. Enter the info in a sales receipt as a summary. Then the sales tax system is going to work for you. How do you code an item that is subject to additional tax because of its type, such as lodging? All sales take place in one location, so each customer can be set to pay the same state tax, but lodging-related items are subject to both the state tax and an additional lodging tax. It looks like items are only able to be specified as taxable or not — there is a tax code, but not a tax item. Can I set up an additional sales tax code to attach to these items to have them taxed at a different rate? There are several ways, it depends on how you want to treat the taxes and see them show on reports. It is hard to go into detail in blog comments, you should talk to a qualified QuickBooks advisor who can sit down with you to go through the details. In summary, one way is to have the lodging tax set up as an “other charge” item and add that after each line that has that tax. This doesn’t put the numbers into the sales tax reports – which might be what you want, or might not be. Another approach is to have separate sales tax items for these kinds of situations, and insert them in the detail of the order, rather than using the tax at the bottom of the order. That has different advantages and disadvantages. But you should talk to an advisor who can look at your specific situation. all sub accounts of 2200. But the balance sheet shows only Sales Tax Payable 2200 with any dollar figures, so the payment/check has to be db Sales Tax Payble, cr cash in bank, and does not show the amount for each entity? QuickBooks is set up to have only one “sales tax payable” account. You would see the amounts due in the “sales tax liability report” instead. As I surmised. Strange that it does not track the amounts due for each “sub account”, but probably simpler for non-bookkeepers/accountants to understand. Thanks for your quick response. Thought I was missing something. How do I get non-taxable invoices to not hit the sales tax payable account? Its so frustrating seeing line after line of zeros. Most of our customers are non-taxable. Also, on the sales tax payable report some of the non-taxable invoices show up on a line called TX Sales Tax, in the total sales and in the non-taxable sales sections. But then there is a whole different line below that called No Tax Vendor, non-taxable. I can’t figure out how QB differenciates between invoices to determine which total to put them in. Suggestions? I’ve set up my sales tax group as Sales Tax Payable for my customer invoices. How should I label the accounts for paying those taxes to each jurisdiction (state & local, I currently have each listed as an expense)? Thanks. Jennifer, review this article for the details. Your “sales tax group” item won’t point to any account. The detail sales tax items automatically send info to the proper Payables account. You track the different jurisdictions, if necessary, by creating a sales tax ITEM for each jurisdiction (and combining them in sales tax groups). I’ve entered the new sales tax in the item list and made the old rate inactive. However, when creating an estimate, the old rate comes up, and the new one is not in the drop-down list. This only happens with estimates, not invoices. Any suggestions? Thanks. Thanks for the reply. I’ll get someone in to check it out. The new 1099k forms report total credit card transactions including sales tax to the IRS. How do I set up sales tax collected as income. Right, Luann, you don’t have to worry about that as far as I understand it. We’ve changed over all of our customers to the new (old) British Columbia sales tax. We are running into a problem with the sales tax on specific items. For example, freight, which is not subject to Provincial Sales Tax, still shows up at 12%, despite our having changed the “freight” item to GST only at 5%. It seems that the customer tax code is overriding the item tax code. Is there a way to remedy this? Can a customer have one tax code and an item another without manually altering the freight tax code on every transaction? Mike, unfortunately I can’t help you with this, as I don’t have a copy of the Canadian product. Oh well. Thanks for responding anyway. I need to create an invoice totaling $63 that is taxable. So when I back out the sales tax, due to rounding, it totals either $62.99 or $63.01. Do you know how to adjust this? Thank you! If you enter the sales tax item as a line in the invoice, you can enter the amount you want for tax directly. I’m preparing the sales tax return and got all the figures from the quickbooks sales tax report. However, the Sales Tax Return says I owe $13654.00 but in the sales tax report it shows Sales Tax Payable as of 6/30/13 shows $15,330.00. A difference of $1676.00. We overpaid the sales tax prepayment on the 2012 4th Q by $1676.00 and we received the refund on April 4, 2013 same amount. I posted the refund to sales tax liability account, as other deposit. So, I’m not sure if I should be posting the refund to sales tax liab account or other income. Could the refund be creating the difference on the Sales Tax Report? Thanks for your great article and explanation. I understand how to make a group of tax items to handle each nexus in say WA for state sales and local sales and that is great. What I am trying to do is also add our company tax liability that we do not pass on to the client (eg Washington State B&O tax) but tie it to the invoice. So if we charge the client $100 on a line item on an Invoice and their Group Tax adds 9% and charges them $109, how do i also have $0.41 hit a Tax Liability Account that we are responsible to pay so it hits our P&L and is ready to pay at the end of the quarter. Can we have an item that we are responsible for and is part of the tax group for the line item but does not bill the client or is there another smooth workaround? I apologize if this was already addressed earlier but I don’t have time to read over 200 entries. We have Quickbooks online for our small business. We just switched to the online version this year…thinking it would make life easier. My husband spent 4 hours with customer service yesterday and they can’t help him with his problem. We have a pool servicing business. We obviously don’t charge sales tax for pool service. We only charge sales tax if we’re billing for products. We need to report to the tax reporting agencies 1) TOTAL gross sales – meaning all invoices whether they had sales tax or not 2) Of that gross amount, the amount that is taxable and then 3) the difference. The desktop version tax liability report showed that. On the online version…it does not. It only shows the total of TAXABLE amount invoiced; it does not show the total gross. For all the invoices that were for services only in which no tax was charged….it shows zero. My husband thought of creating a tax item that says “0%” and include that on invoices for non-taxable services only, but in another blog I read that it doesn’t work. So, he is at his wits end because he is thinking he is going to have to manually total over 700 non-taxable invoices to get the correct gross. Is that really the only solution? Christie, my apologies – this article is about QuickBooks Desktop sales tax. As you have found, QuickBooks Online is very, very different. Sales tax is an area that I haven’t explored in QBO yet, so I don’t have an answer, other than to say that QBO is much more limited at this time. Thank you for posting this. Sometimes simple things in QB can be frustrating to figure out. I was just missing one of the three items on the estimate and having quite the time trying to figure out how to fix it via QB help. Thanks so much for making it simple to understand! This has been very informative — thank you! Unfortunately, I am still running into an error in which no sales tax is being calculated on my invoices. I have quadruple checked that the customer tax code is taxable, the tax item has been selected and the tax setting on the item is selected…but still the sale tax is not showing. (I am using QB for Mac 2013.) Any advice? Appreciate it and thanks again for this easy to understand overview! Nicole, at this point, I don’t have any suggestions without being able to get hands on the system. I’ll also note that I don’t work with the Mac version, so I don’t know if there are any tricks there (or bugs?). Thanks Charlie! Appreciate the help all the same! Hi Charlie, I figured it out. I made an invoice prior to adding all the appropriate sales tax steps. The invoice wouldn’t then self populate. I needed to delete the invoice and create a new one for the sales tax to calculate. I mention it here in case other people come across the same error. Thanks again! Ah, yes, that makes sense Nicole. There is a reason for that – they don’t want changes to your tax settings to go back and affect older invoices, which is a good thing. It is a good thing. Thanks again. Now, I know for the future. We own a gourmet food truck and charge an amount that is inclusive of sales tax. In other words, a sandwich sold for $10 actually sells for $9.25 and we collect $0.75 sales tax. How can we enter the $10 and the tax rate into Quickbooks and have the program make the appropriate adjustments, so that our sales are not including the sales tax. Sarah, off the top of my head, I would consider looking at a “group item” that has the actual sandwich and then the sales tax item. How do I enter tax on invoices received for purchases? Liza, that would be just another component to the cost of the item you are purchasing. It doesn’t fall into the “sales tax system” in QB since you aren’t reporting that to a taxing agency. How do I properly enter tax penalties into QB2013? Currently the system reflects that I overpaid. Bill, I would have to know a lot more detail. You should work with your financial advisor on this. Off the top of my head, depending on details, you may want to do a sales tax adjustment (under Vendors/Sales Tax). Don’t do a posting like a journal entry or bill or credit directly to sales tax payable. Hi every one jo here. now im using pro(quickbooks) and im required to compute withholding tax for my customers so that im not charged more than required. may be to be more clear, here in Uganda people you provide service to can as well be tax agents depending on the payments they make due to the size of the entity, in other words more payments (URA) Uganda revenue authority approaches one to to hold a percentage of ones payment. Jo, I’m not sure that I can answer that, as there are a lot of different issues here. Comments in blogs are hard to use to provide detailed help. I recommend that you go to the Intuit forums at https://community.intuit.com/ and post your question there. I live in a city that charges sales tax, so when we buy office supplies for our company, we are charged sales tax. When I go to Vendor/Bill and want to post the receipt from the office supply store, I can’t seem to find a place to add sales tax. Any help would be appreciated..
For supplies, you could just have a sales tax expense account and use that account on the “Expense” tab of the bill. Actually i want help on how to include this on an invoice that im to send the client. Hi Charlie , i am using enterprise solutions , and i have question regarding , In put tax, is there away we can capture the input tax( tax paid when purchasing goods 0r services ) that needs to net off with the sales tax ? sales tax amount on a sales receipt. How do I accomplish that. Case – For NY state, there are more than 25 counties with various rates but payable to NY state. I don’t need customer/invoice details as I am posting GL entries in this file. I am trying to separate Sales tax collected from the gross amount daily so I can track it in Sales tax payable account. Pravina, I’m not sure that I follow all that you are asking entirely. You say you are entering a sales receipt, but then you imply that you are doing other adjustments, so I’m not clear as to what you are trying to accomplish. Sorry if this has been asked. We take credit card downpayments for jobs to order materials. The job is not billed until its complete. Is there any way to take a credit card down payment without charging tax until the end of the job? Typically the job is complete 4-6 weeks after the down payment. Also, we would file the downpayment as labor, but many times the labor is far less than the actual down payment. Any ideas? Sure, you can receive a payment and hold it “on account”, then apply it later. Details of this are hard to lay out just in blog comments, though. I have recently updated my 2001 version quickbook to a 2010 version. Now whenever I enter a taxed invoice in the amout colume in the 2001 version,on entering the actual purchase price(ie without the tax) the system would calculate the tax and store it for further reference. I have noticed that with the 2010 it is not doing same. What adjustment I would to make? I can’t speak about how the 2001 version worked, and I’m not sure I quite follow what you are saying. As this article describes, with current versions you have to turn on the sales tax preference, create a sales tax item, assign that item to be the tax item for the invoice, specify that the customer and the item are taxable. Then QuickBooks will calculate the sales tax for you. In preferences, sales tax is turned off. Still, when creating an estimate, I get the message-You must assign a Sales Tax code to this line item. If the item is non taxable,assign a non taxable code. To speed up data entry, assign tax codes to items. You don’t mention what version/year/edition of QuickBooks you are using. Assuming it is a relatively current version of the Windows desktop version, try turning the sales tax preference on, exiting QuickBooks, restarting QuickBooks, then turning the sales tax preference back off. That often fixes this particular issue, but not always. I’m using QB 2013, and I’ve created an item for rental income as I need to be able to Invoice/receipt customers for rent payments. However, I do not want rent income showing up when I go to my sales tax liability report. When I go to create an item, the tax code option is mandatory, so it’s forcing me to choose tax/non-taxable, thus when I save a receipt it automatically throws the income into my sales tax income report. I do need to keep my sales tax preference on, as we have an actual business, and I do collect sales tax also. I shouldn’t have to choose a tax category for rent because rent should not be reported under sales liability. Please help! If you charge sales tax in some cases, you have to leave the preference on (as you found). There are several ways that you can deal with this. Perhaps the simplest is to create a “sales tax item” that you call something like “Rent no sales tax” or something similar. When you create that item you can either leave the “Tax Agency” as blank, or you can create a dummy tax agency vendor. Do NOT use the same tax agency as you would for your normal taxable sales. Use this tax rate in the invoices for rent. This will put these transactions into a different portion of your sales tax reports. They will be separated into their own section, by the “tax agency”. That makes it simple for your reporting. There are other ways, and other things you can do, but that should cover the basics. If you don’t want these to even show on the report itself (there isn’t a reason why you shouldn’t, though) you can set up a “Sales Tax Code” for “Rnt”, and use that for your rent items. 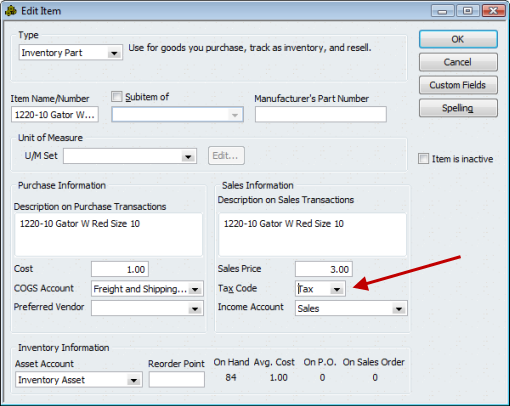 Then in your sales tax reports you can set a filter to exclude the “Rnt” transactions, and the report won’t show those. But that is a bit more work to use. Thank You for the reply. I have tried both of your options. With both methods, the items still show up on my sales tax liability report. When I create a receipt using the rent item, and choose the ‘rent no sales tax’ item, I still have to choose a sales tax code, whether it be the new Rent Tax Code or by just using generic ‘nontaxable’, but either way, it still shows up on the report. So, I have created both the sales tax item and the sales tax code, and will use both on my receipts. I was afraid of the items showing up on my liability report because the rental amounts are added to total sales. But, now I see that the amounts are broken down, so it gives me a total without the rent (which is the one with the tax agency i choose), and one without the rent used (the rent sales tax item). Thanks a bunch! Elise, my apologies for not making it clear – these values will (as you found) show on the report, you can’t get away from that. However, they will be segregated so that you can clearly see which values to report as sales tax and which to not. Solution: quickzoom on the taxable sales total on the sales tax liability report for each sales tax item with a zero rate. Edit each of the transactions with a sales tax item with a zero percent rate by changing the customer tax code on the sales form to use a non-taxable sales code. Does this message have any importance? I know that there’s a 0% rate because i that’s for my ‘sales tax item’ called Rent. That is an error check just so that you can be sure that you don’t miss something. it is warning you that there is something that MIGHT be wrong in some situations. In this case you can ignore it. I’m back. So, I chose ‘No’ to in Sales Tax – Company Preferences – to the question of ‘Do you collect sales tax’. Sure enough, this solved the problem, however, then I was unable to charge sales tax when necessary, and all of the sales tax liability options disappeared. So, it didn’t solve the problem. I’m thinking the only option is to choose no to sales tax when you have to create a rent receipt, save, then once finished, go back to clicking yes to sales tax. This actually worked because I tried it, but there has to be an easier, less tedious way! I cannot find this answer no matter how I google for it. Perhaps I am approaching it wrong. I sell on Amazon, and do not import actual customer orders into Quickbooks Premier 2013. I calculate sales tax outside of Quickbooks. I wanted to enter sales tax I paid last year for record keeping purposes, but I do not know how to do this properly since I’m told it’s not an expense. Any help would be appreciated. Toni, that would depend on how you are entering your sales/invoices. If you sell something for $25 with $2 in sales tax, are you posting $27 to sales, $25 to sales and $2 to taxes payable, or just posting the $25 while ignoring the sales tax? Self assessed tax. As a contractor in Canada I need to self assess pst for most of my customers however sometimes the customer comes in and picks up the product so I need to charge pst on sale of product. I have already paid a portion of the pst through self assessment but I need to submit the difference from sale of goods pst minus the cog pst. Do you have any ideas how to do this within the application. Karen, I don’t know the details of Canadian tax law so I’m not sure that I can make a good recommendation for you here. Sorry! Hi, I’m trying to find the 3 digit sales tax code for my area to set up Quickbooks but I’m unsure where to find it. Quickbooks requires you to have the 3 digit code to set up sales tax codes, you can’t move forward with sales tax until you put that code in. I have googled it trying to find it but I was not successful, do you know where or how I can find the 3 digit code for sales tax in my area? Your help would be greatly appreciated!!!! Thanks!!! Courtney, there are a couple of things you need in QuickBooks desktop products for sales tax. One of them is the “Sales Tax Code” – a 1 to 3 character code. QB comes with two already built in – “Tax” and “Non”. You find these in the “sales tax code list” that is under the “Lists” menu. You wouldn’t normally have one for “your area”. Most businesses can get by with just “Tax” and “Non”, although there are things you can do with those codes to get more info. Your local sales tax rate would be something you would create as a “sales tax item” or group, as described in the article. That is where you enter the tax rate for your locale. How would I go about adjusting the Balance sheet sales tax amount to the amount that is correct within the “Pay Sales Tax” screen. I have about a $10000 difference between what the Balance Sheet says and what I truly owe. Every time I try GJE I have to input the Vendor name and it resets the Sales Tax Module. Matt, you never want to use a General Journal Entry to adjust Sales Tax Payable. Use the “Adjust sales tax due” function, in the Vendors/Sales Tax menu. Someone previous to me must have done something. Sales tax reports look fine, but my Balance Sheet amount is about $10,000 off. My sales tax due amount does not match balance sheet amount due. Look for GJE’s to the sales tax account. Or, work with a ProAdvisor or Sleeter Certified Consultant (click on the “find a consultant” graphic at the top of the page) – there is a tool in the QuickBooks Accountant edition that can be used to help pin these kinds of things down easily. Charlie I’m new to all this. I know how to set up my taxes and all that but where I’m located our city tax is 4.35 but we buy parts in a different city and our customers are from all over so what tax do I charge them if we perform the work all in one location. For instance we pay for parts and get charged 4.60 city tax on some parts do we charge the customer the same on their invoice. also do we charge the customer tax from where they are located or the tax where I am located? Kristi, that kind of thing is something you should talk about with your accounting advisor, and your local sales tax agency. Laws on sales tax vary from State to State. In a general sense, at least where I’m located, I would have a resale certificate so that items I purchase for resale wouldn’t be taxed. As far as what you charge the customer, that depends on many factors that are complicated. Do you have a “presence” (called “nexus”) in the location of the customer? What kind of item is being sold? Many factors. For example, where I’m located, if I sell a computer to someone out of my storefront I charge them local taxes, but if I’m selling them a car then I charge a rate based on where they live. It is very confusing. Another question what is you blog for reporting? THANKS FOR YOUR RESPONSE IT IS VERY CONFUSING. ME AND MY HUSBAND STARTED A BUSINESS WORKING ON CARGO TANKS. WE HAVE TO BUY THE PARTS TO WORK ON THE TRUCKS WE HAVE A RESALE CERTIFICATE AS WELL HERE BUT WE HAVE TO HAVE 6 MONTHS OF RESALE FIRST BEFORE WE CAN GET IT. WE BUY THE PARTS WITH DISCOUNT AND CREDIT AND THEN WE CHARGE IT OUT TO THE CUSTOMER. SO JUST WASN’T SURE ON THE TAX SITUATION BUT I’M SURE I WILL EVENTUALLY FIGURE IT ALL OUT. AND ON THE OTHER QUESTION IN THE DESCRIPTION ABOVE IT SAYS YOU WILL HAVE ANOTHER BLOG ABOUT REPORTING TAXES. CAUSE I HAVE TO REPORT OUR TAXES FOR CITY AND STATE AND THAT’S HOW I WILL BE ABLE TO GET A RESALE CERTIFICATE. My apologies, I haven’t written that followup article yet. It is on my “to do” list! We have two additional taxes on telephone services that we must charge our customers. SO we have to charge a Sales Tax, a USF fee and a TRS fee. Ideally we would like and need these taxes to show up seperately, or show the tax detail on the invoice. Do you know how I would do this? We currently use QBO online Plus. Thank you for your help. How about just adding those fees as regular charge items? You don’t get some of the benefits of the sales tax reporting features, but you can add the charges. It depends on how you want to manage those charges. My thought was that the rates change frequently and if I had them listed as a tax I would just have to change it one place correct? That is why I was hoping to be able to have it listed as a tax. Changing the rate of a tax item is just as easy as changing the rate/price of a service item. They are all items in the item list. In fact, sometimes changing a rate in a sales tax item causes some extra hassles because of how they are listed in the sales tax reports. The benefit of the sales tax item is how they are incorporated in sales tax reports, but you might not need that depending on what your requirements are for these taxes. Yes…I am sorry I say rate…but it is a percentage. The USF rate is a percentage of our voice service rate. SO it works like a tax. When you say service item, I assume you mean a line item of the invoice…am I able to create a service item that calculates on another service item? Do you know if there are any other versions of QB that enables you to list tax details on invoices? You can create a service item (or other charge item, if you prefer) and enter the rate as a percentage. Just enter “10%” in the rate field. Then you add your regular item, like a “widget” if that is what you are selling, and underneath that you put this service item with a percentage rate, and it will apply that percentage to the item just above it. If you want that percentage to apply to several items, you enter the several items, add a “subtotal” item under that, and enter the percentage item underneath the subtotal. Hi, We own a Heating, air conditioning, and deliver heating fuel oil in New Jersey. Our state requires that we charge gross receipts tax on the fuel oil to commercial accounts. This tax is not a percentage but is flat amount of 4 cents per gallon for businesses or 2 cents per gallon for properties that are partially business and residential (example: store with residential apartments). My question is: can I set-up QB to charge this flat fee tax per gallon? I only see percentage taxes for items. Thanks so much for any help you can suggest. Dee, you can manually enter the amount in the invoice – select the tax item and then change the amount to the fee you want. If you don’t want that, you can just create a service or other-charge item for the rate that you want and add that. You don’t have to use a “sales tax item”. Then, of course, you don’t get the benefit of the sales tax reports, but in many cases that isn’t an issue. It does depend on what your reporting requirements are. Thanks so much. One more question – Presently we have QB Pro Plus 2013 for two users (which is approximately $500/year). We were considering switching to QB Online because I travel quite a bit and would like to easily access our accounts. The other user is always in the office. When I called QB to compare the Pro Plus to QB Online, Customer Service suggested “QB Hosting”. Would you recommend this? She explained the benefits were: wouldn’t have to change our present QB which has more benefits and features then QB Online. This QB hosting is quite expensive – we would still need to pay the $500/year for the Pro Plus + $900/year for the hosting = $1,400/year. What would you suggest? In your situation there are a couple of options if you want to stay with the desktop software. What works best depends on how you use QuickBooks and what work you would be doing while traveling. The simplest/cheapest is to have QuickBooks installed on your desktop computer in the office, leave it on while you are traveling, and use a remote access program like LogMeIn or TeamViewer (there are many on the market) to access that desktop over the Internet from a laptop or a tablet computer (I do this using my iPad when on the road). Low cost – you only need the remote access program, which can be very cheap. The main issues here are security (you are leaving your office computer on all the time, while you are gone, so someone can use it), availability (you have to remember to leave that computer on when you travel!) and speed (often access like this is slow, depending on many issues). One nice thing about this is that it is very simple to test, you often can get a trial version of the remote access product to try, and there are no other costs. “Hosting” from an authorized QuickBooks hosting company like Cloud 9 Realtime or Right Networks (there are others) can work very well. There are advantages and disadvantages. Usually you will find that the remote user will have faster access than a “remote login” situation like I describe above (but not always). You don’t have to worry about leaving your office computer on all the time. However, the cost is higher. The person working out of your home office will now have to work over the Internet. You may have restrictions on what add-on software you can use. One thing that I would point out is that you don’t need to use Q Pro Plus if you don’t need the “Plus” benefits. A purchased copy of Pro can also work, if that fits your situation. That would reduce your annual cost a bit, if you don’t update every year. I recommend that you talk to a knowledgeable accounting professional who can evaluate your situation and make the best recommendation for your needs. Thanks so much for your time. You have been very helpful. i have purchased a 2013 US version of quickbooks and need to account for VAT. How do i convert a sales tax module to a VAT regime where there are three vat rates. Robert, the US version doesn’t support a VAT model. You should be using the UK or possibly the Canadian versions (I know UK handles VAT). When I setup the company’s tax items, I forgot to link with G/L accounts. Now, after entering the bills we received, I can see the GST/QST(5% and 9.975%)but when I run the report, all tax were automatically put into expense accounts instead of separating into net expense and GST/QST. How can I link sales tax item with accounts? I can’t help you with the Canadian version in this case, as I only have the US version. In the US version you don’t specify an account in a sales tax item, as it always posts to Sales Tax payable. You will need to find a Canadian expert to help with this. New York has different filing periods than other states. Most are Jan-March and so on but NY is Dec-Feb and so on. So when I go in to pay my quarterly taxes for NY it always show the wrong totals…to pay these taxes I have been adjusting them every quarter to reflect what we owe. is there a way to set it up on the backend so that it calculates the right months for this particular state? Using QB for mac 2014. Jillian, I don’t have a Mac version to test, but in the Windows version a “sales tax adjustment” is essentially a journal entry. You can go to the list of general journal entries and find the adjustment there, to make changes. Or, find “sales tax payable” in the chart of account to get a list of entries against that account, and edit the transaction. Hi there, we are new to using Quickbooks Enterprise (QBE) and need to set up two scenarios for collecting tax from our customers. The first being a standard percentage for parts and materials sold to our customers, which we have set up, the tax liability account seems to be reporting properly. The second type would be sales tax factoring for certain customers that we need to collect tax from but not show it as a line item on their invoice Example – we have a lot ‘tribal’ sales – they all claim to be tax exempt but in reality the sales do not qualify for exemption. Rather than make a dispute out of it, it would be easier to use a factored sales tax method. Do you have any suggestions on how to set up in QBE? Thank you for your time. So if you have a sale for $100 and there should be tax of $10, you are charging them just the $100? How would you be accounting for the $10 internally? Who pays that? If you don’t mind the invoice being for $110, and you just journal off that $10 somehow, you can create an invoice template that has the sales tax box at the bottom, but use the layout designer to change the font to white. That (on most printers/forms) makes it disappear. Hide the sales tax and total, just show the subtotal (which is before tax). But that might not be what you want. Hello Charlie, our company fabricates and installs signs. Sometimes we install signs on new constructions. For these type of projects we should only charge taxes on the materials used to fabricate not for the entire project. The problem is that I have no idea how I can set this up on Quickbooks so that we don’t have to manually enter it on the invoice. That depends on how you want to show things on the invoice. If you itemize it all, simple, just mark those items as taxable. If you don’t want to itemize, you want to show just one line for “sign” with a charge, then I would play with a “Group Item” – to hide the details. And then mark the detail items as taxable, within the group. Charlie – we pay sales tax in multiple states….do you suggest a Tax Exempt Sales Tax Item for each individual state to properly track $$? how about Out of State; do you recommend one for each state we report to? I assume it will provide much more accurate and detailed reporting on the sales tax liability report? Jo, if you want to use the sales tax liability report, you need a vendor for each separate tax agency you report to. Therefore you need, at the very least, a separate sales tax item for each agency since you specify the agency in the sales tax item. And a sales tax item for non taxable situations. You may need more, but that would be the minimum. thanks, Charlie – I do have many separate sales tax items for the different states we report to; and I have groups, so due to this I have State, County and City items already created. But before I started here (just new 2 mos.) they were putting all tax exempt sales into one item (no state agency assigned) and that seems somewhat wrong. I would think you would want the TE sales to fall under the total sum for the State sales and it helps to total your sum of sales in the state for the period given. Logical? one more thing – I wanted to do the same with OOS (out of state) set up for each agency. your thoughts? I have also read that you really shouldn’t use Non Taxable as a Code. That you should specify GOV (government), RSR (reseller), NFP (not for profit) etc. Again, your thoughts? the more I think about it, I should probably make Tax Exempt and Out of State a tax code and not a tax item? You can set up a non-taxable code for each state if you wish. The more complicated you make it, the harder it is to comply, but again, you need to see what all the states require in their reporting. Some people use the “code” feature more than others. You don’t want to make TOO many codes, as it complicates the report if you go overboard. Tax Codes will add columns to the report, while tax items add lines. Jo, every state has their own reporting requirements, so you have to look at what they require. What is taxable in one state may be non-taxable in another state, for different reasons. The best I can say is that you have to come up with a configuration that makes sense for your particular situation, that generates the report in the fashion that fits your needs. Thanks for the great article. It has been a couple of years since you wrote it, but am hoping that you will still answer my question regarding sales taxes in Quickbooks. I am in Colorado, which has a fairly complicated sales tax system, and so I multiple sales tax codes to classify why certain items are taxable or non-taxable (as you explained so well in your article). I am currently using QB for PC 2007, but am desperately needing to upgrade to a newer version of QB. I want to move to QB for Mac, as I use Mac for everything else, but as best I can tell, QB for Mac doesn’t allow for multiple sales tax codes. It just lets you mark an item as “taxable” or “not taxable.” I don’t know how I could possibly do my sales taxes without having multiple sales tax codes. Is there some sort of work around or functionality that I’m not aware of? What am I supposed to do? P.S. my apologies if you’ve already answered this question. I didn’t read through all 300 comments on this post. Laura, my apologies, I don’t work with QuickBooks for Mac so I can’t give you a definitive answer to that.I recall something about that being a difference, but I can’t confirm that at this time. QB for Mac is designed for smaller businesses that have less sophisticated requirements, so this kind of thing doesn’t surprise me.. Many people use a PC version of QuickBooks on their Mac, using some Windows emulator (there are several), to get around these kinds of shortcomings. Thank you for your response. Not the answer I was hoping for, but I appreciate it. I guess may not have any choice but to deal with this extra layer of complication and expense for such a tiny thing! Honestly, my business is not all that complicated, but my sales taxes are. Thanks again. thank you Charlie, your point about over complicating has already been recognized. I appreciate your feedback. trying to clean up someone else’s mess; where in she was writing checks and not using Manage Sales Tax Icon. so that’s where I started, but still have far to go. Thanks again for your valuable opinion! We are a small renovation company and use Quickbooks for all our invoicing, estimates, accounting, etc. One of our clients needs is requesting that we post the 13% Canadian hst tax for each service we provide, on the same line. Basically they want a ‘Tax’ column beside our ‘Price’ column and for the Tax row to show the 13% tax price for that specific service. I hope I’m explaining this clear enough. For each numbered line they want the tax to show beside the price, and for the tax to be calculated based on the price. Is this possible? I can email you if you like to show you more clearly but I would need your email you. Thank You. Hope you can help! Peter, I don’t work with the Canadian version, so I’m not sure if there are differences in that version that would affect this (other than the HST differences that I’m aware of). However, I doubt that there is much difference here between the US and Canadian versions. What you are asking for is a very common request, but QuickBooks can’t do it. Sales/HST tax like this is not calculated by the individual line in QuickBooks – the program totals the taxable amount and then applies the percentage just to that total. So, not only is the tax value not available on a given line, you may find in some situations that if you did calculate the tax on each line separately, then totaled the tax amounts, you would get a different value (by a few cents) than what QuickBooks calculates. I am wondering if you have any idea(s) on how to fix a reoccurring issue I have with how QB tracks Total Sales, pertaining to Sales Tax. Each year when my accountant reconciles gross receipts reported on my Sales Tax and Use return with the gross receipts from the general ledger (Profit and Loss report), there is a discrepancy. This occurs due to me using the QB feature of marking an expense as “Billable” to a specific Customer, and then invoicing the customer for the reimbursements. I pay $50 to a Vendor for Auto Expenses; $20 was a legitimate business expense and is accounted for in the “Automobile Expenses” account with no Customer, the balance ($30) was not a business expense – I paid for something at this Vendor for a different company I run (“Company 2”). The $30 portion needs to be reimbursed, so I again select the “Automobile Expenses” account, but this time I select the Customer “Company 2” and “Billable” is automatically checked. I then create an Invoice for Company 2, and select the reimbursable expense. When looking at the Profit and Loss statement (Accrual Basis), there is a $20 expense under “Automobile Expenses”, and no income. Further investigation shows a $30 debit as well as a $30 credit to this account. This makes sense. The issue is when I run the Sales Tax Liability report; here, I see “Total Sales” of $30. This amount is categorized as Non-Taxable Sales, but the issue is I did not sell $30 of Automobile Expenses – it was just a reimbursement. How can I track reimbursements without creating this discrepancy? Sales Tax Adjustment: After entering open invoices at year end, it will have a sales tax balance on the invoice. How do you adjust that? and where? Opening balance equity? Is it the same process with Payroll liabilities? Robin, I can’t give specific answers because the details vary depending on your situation. Existing invoices – depends on whether the sales tax is still liable or has already been paid. Where to post, depends on how you are handling all of the startup balances for all accounts. Just keep in mind, the automatically created “sales tax liability” account – don’t post directly to it (use transactions or the functions designed to adjust it). Do you have a best practice recommendation for tracking sales tax already paid on resale items. Sometimes online vendors are not setup to accept a resale exemption certificate and sales tax is paid on items that are later resold. However, here is what I would do to deal with it when you have to. On the purchase transaction (e.g. credit card charge or check), separate the sales tax paid amount onto it’s own line and code it to Sales Tax Payable, and enter the name of the tax agency in the name column. This debits sales tax payable so it will show in the sales tax reports, and it will show as a reduction in the “Pay Sales Tax” window. But it will also be messy at sales tax return preparation time. You’ll have to separate the total tax paid on purchases onto a separate deduction line on the tax return. That’s different for each state. Sir I Issued (Quick Books ) invoice to my client with 10% GST (as my Country Tax Rate) Than My Client Deduct 2% GST that Paid by Him. and Remaining 8% GST he give to me for Paid by me. Now My Question is that how i will Adjust 2% GST that Paid by my Client . Please Answer me if you Understand. Did the client pay that 2% to you, or directly to the taxing agency? Do you need to show the 10% on your reporting to the tax agency? You can either adjust the tax amount in the invoice (if you don’t have to report the full amount) or make a “sales tax adjustment” to adjust the amount due. We’re based out of IL. Just starting doing business in FL. I just had a customer call and tell me our invoices are incorrect. In FL the county surtax can only be charged on the first $5k of an invoice and once over that amount no surtax.. Any thought on how I might be able to apply this in quickbooks. I see a few comments on change the percentage but not how to apply for my issue. The exact setup for your situation would require a bit of digging into your specific business. I suggest you reach out to one of our consultants in Florida who can help you with the best solution. Crystal, this is one of the long-time complaints about sales tax in QB. There isn’t a way to put a cap on the amount that is charged, at least not easily. I haven’t worked with this specific situation (I’m not in Florida), but you can’t have QB calculate the tax. One thing to investigate (I haven’t gone through this in detail): create a sales tax item that has a zero % tax and assign that to the invoice. Then add a sales tax item to the invoice as a detail line. It will show the percentage, and that won’t be correct because of the limitation. 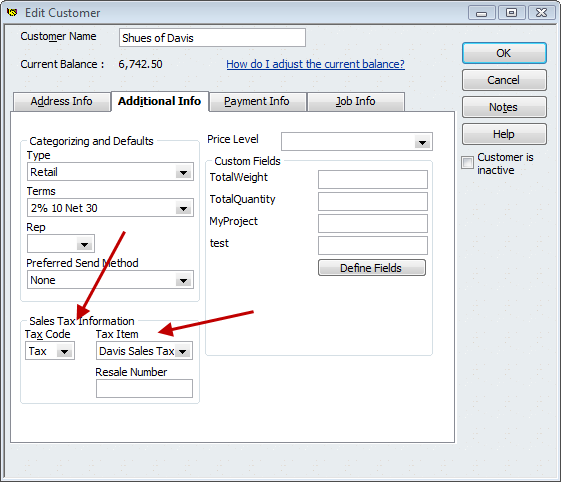 Then manually calculate the tax and enter that in the “amount” column for that sales tax item. This will give you the right tax, BUT I’m not sure if that creates a problem in the sales tax reports themselves. That is something you will have to test. I’ve not looked at it in detail so there could be some issue with the reporting. Great article! I’m hoping you can help me with this one. I’ve got Quickbooks Pro 2016. I’ve got some items that are taxed and some that aren’t. When I print my statements for my non tax items it will still print a tax line but it shows it as zero. It’s not throwing anything off, but it confuses my customers a bit and makes the statement hard to read when the item details are turned on. You say “when I print my statements…” – do you mean “invoices”? Do you have a sales tax box in the footer of your invoice? Sorry for the lack of information (I accidentally hit the send button). It is the US version and I’m running Windows 7 Pro 64bit. I a nut shell what I’m trying to do is use my end of the month statements to show my customers a detailed list of their charges ( I don’t print the invoices). I toggle the “show invoice item details on statement” and it shows the detail but for every item directly below, it also prints a line for tax even if their item wasn’t taxed. Ah, yes, I see what you mean. Unfortunately, that is the way it works. I don’t see a workaround, as far as “statements”. Something for you to comment to Intuit about using the feedback option in your help menu. On my ST Liability Report the Taxable Sales multiplied by the Tax Rate does not always match the Tax Collected. We are on a cash basis. When I receive a deposit it is entered on a Sales Receipt as non-taxable. When the invoice is processed the taxable sale is marked as such and the deposit is deducted and again marked as non-taxable. Those postings, of course, can be in different reporting periods. Many thanks for any help. This article is very interesting and helpful. Thank you for sharing! On my ST Liability Report the Taxable Sales multiplied by the Tax Rate does not always match the Tax Collected. We are on a cash basis. When I receive a customer deposit it is entered on a Sales Receipt as non-taxable. When the invoice is processed the taxable sale is marked as such and the deposit is deducted and again marked as non-taxable. Those postings, of course, can be in different reporting periods. Many thanks for any help. That sounds complicated, you may want to sit down with someone to work out the details. You can investigate the details of the transactions to see where variation comes in – note how QB calculates sales tax, you might see some variations when comparing dissimilar reports. And, on the surface (without discussing details), I’m not sure that I like the way that you are working with deposits, sales receipts and invoices.